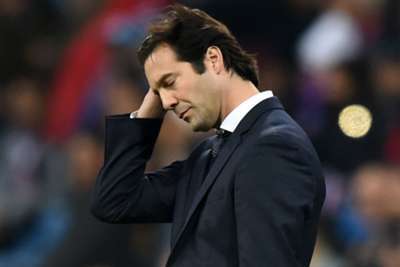 Santiago Solari accepted responsibility for Real Madrid's 3-0 Champions League defeat against CSKA Moscow at the Santiago Bernabeu - the club's heaviest home loss in European competition. Fedor Chalov, Georgy Schennikov and Arnor Sigurdsson completed an unlikely double over Madrid, the Russian side having also beaten the same opponents 1-0 in the reverse fixture. The result had no impact on Madrid finishing top of Group G but marked a humiliating episode in their illustrious history. "I'm sad because we'd already qualified and we wanted to close out the group stage with a good night and it was not like that," said Solari, who gave some of his fringe players a chance from the start on Wednesday. "We started the game well and the first 30 to 35 minutes were good. But we were not strong in either box and they punished us. "I'm sad because of the result. We took risks and the game could have been different. Football often depends on forcefulness and today we were not decisive at either end of the pitch. "The match was an opportunity to give some players some game time, either because they don't usually get many minutes or because they have come back from injury. "We took the risk of fielding a line-up like that and I take responsibility for it." One of those players to come in was Isco, who - apart from a Copa del Rey clash with Melilla last week - had not started a match since October. But the Spain international failed to impress and was seen to react to jeers and whistles from the home fans during the second half. "We don't like whistles towards anyone but we were not good and we have to accept that," added Solari. "I have not seen it [Isco's reaction]. It's frustrating to lose at home and it's not what we expected. "It's normal that they whistle. The fans express themselves because they do not like the result." Despite their historic win, CSKA missed out on qualification for the Europa League due to Viktoria Plzen's 2-1 win against Roma. "It's sad to say the least to beat Real Madrid, earn seven points, but finish bottom and get eliminated from Europe," CSKA boss Viktor Goncharenko commented. "But we only have ourselves to blame. In any case, we've made sure we'll spend the holidays in a great mood after tonight's win."